In September 1973, Grandmaster Doc-Fai Wong was teaching in San Francisco City College’s Chinese Culture Club. The clubhouse and the classroom were in a bungalow on the campus. He taught classes Tuesday and Thursday, two times per week in the afternoon from 2 to 4 PM. 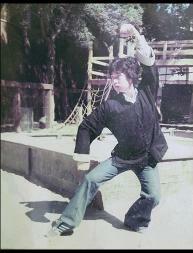 One day he was instructing a class on Choy Li Fut’s foundational form, the Five Wheel Fist form. During the last half hour of the class, an Asian guy stopped by to observe the class. After the class over, Grandmaster Wong asked him in Chinese to see if he needed help or not. He answered him in English with an accent. He said he didn’t understand Chinese and he told him that he was Korean and a Taekwondo instructor on the Campus. He continued to boast that he had received his black belt in Korea and he was a second degree. He said, “you don’t have much footwork in your system.” Grandmaster corrected and told him, “That’s not true; our Five Wheel Stance form has all the good footwork.” He said, “I hardly see any kicks in your teaching; how can you just use hands to stop a powerful kick?” The president of the Chinese Culture Club, Finney Yee was there to observe the class that day. Finney with confidence and excitement said to him, “Do you want to try him out?” The Taekwondo instructor said, “yes, but I am afraid I will hurt him.” Ed Fong, a student of Doc-Fai Wong shouted, “Sifu, let him have it, show him the real kung fu.” Grandmaster didn’t have much choice at that moment so he invited the Korean man to come into the center of the classroom. Grandmaster was standing up high with his knees slightly bent to confuse his challenger. Grandmaster raised his right hand on guard and put his left hand to protect his chest. The Taekwondo instructor was walking around slowly to his right side. He suddenly tried to trick Grandmaster Wong by delivering a low roundhouse kick to his right knee and following up with a quick high roundhouse kick to his head. Grandmaster lifted his right foot up high to a crane stance to avoid the lower kick and he saw the high kick was aiming toward the right side of his head. Grandmaster’s right foot stepped down quickly and he used both fists into a double kwa-chui (hit with back fists, left fist in front), which struck down to the instructor’s leg as it extended. The Korean black belt was in extreme and immediate pain, so Grandmaster seized the opportunity and followed with a right tsang-jeung (palm thrust with fingers pointed downward) to his shoulder sending the Taekwondo instructor 2 meters away where he landed on a couch. All of Grandmaster’s students were cheering and clapping for him. The Korean man slowly got up and respectfully shook his hand. He thanked Grandmaster for showing him the kung fu techniques and walked away limping. Grandmaster Wong ran into the Korean instructor in the campus couple of months later, the Taekwondo instructor told him that Grandmaster injured his shin and he wasn't able to teach for more than a month. Grandmaster recommended that he see an acupuncturist for his shin treatment.